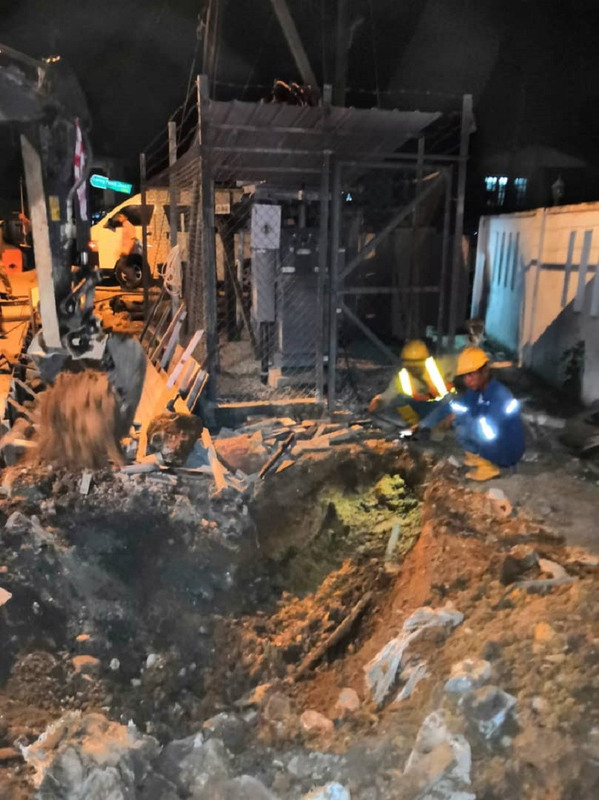 KUCHING, 26 MARCH 2019, TUESDAY: A botched attempt to vandalise an underground cable triggered a power trip affecting about 300 customers at Kampung Gita Lama, Gita Baru and its surrounding areas at around 4pm yesterday. Upon receiving notification on the incident, Sarawak Energy’s utility arm, Syarikat SESCO Berhad (SESCO) immediately deployed its technical team to locate the fault to enable immediate repair works. “After assessing the area, the fault was detected at an underground cable near Taman Mawar II substation. 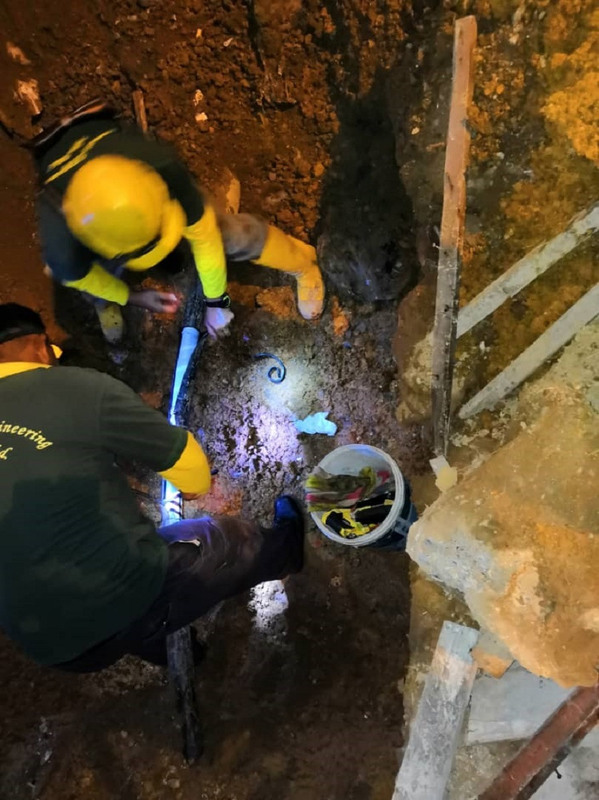 The technical team discovered slash marks on the 11kV cable outer sheath, believed to be done by vandals in an attempt to steal the copper conductor,“ said Hajah Siti Aisah Adenan, Sarawak Energy Vice President for Distribution. “Repairing damaged underground cables require longer time especially if the damage is extensive so we deployed our 500kVA mobile genset to provide temporary supply. Narrow roads made it challenging for the mobile genset team to access the area, but the team managed to supply 80 per cent of the affected area via genset at around 9pm. Repair works were completed, and supply was fully restored at 11.30pm,” said Hjh. Siti. Sarawak Energy reminds the public that stealing electricity cables is dangerous. It can cause serious injury or even fatality due to electrocution. It can also cause unnecessary supply interruption to the surrounding area. There are also incidences where damaged cables caused voltage instability, damaging customers’ electrical appliances. “We seek continuous assistance and cooperation from the public to share with us information on suspicious activities near electrical facilities. Quick actions from all quarters will minimise inconvenience and help to curb this dangerous crime. On our part, we will continue to work closely with the police, increase our site patrols and harden the targets such as reinforcing security measures at our substations and facilities,” said Hajah Siti. To date, Sarawak Energy records a total of 387 vandalism and copper theft cases since 2016, with damages amounting to RM6.12 million. All cases have been referred to the police for further investigation. The public can contact Sarawak Energy’s 24-hour Customer Care Centre at 1300-88-3111, which operates 7 days a week or immediately call the nearest police station. Reports can also be made via “SEB cares”, Sarawak Energy’s mobile app.